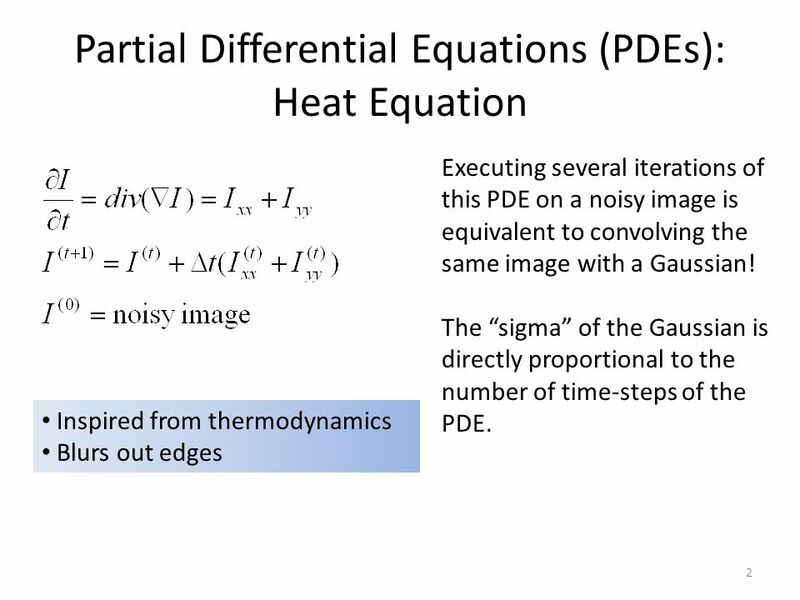 Diffusivity function “g”. Decreasing function of gradient magnitude. Preserve edges: Diffuse along edges not across. 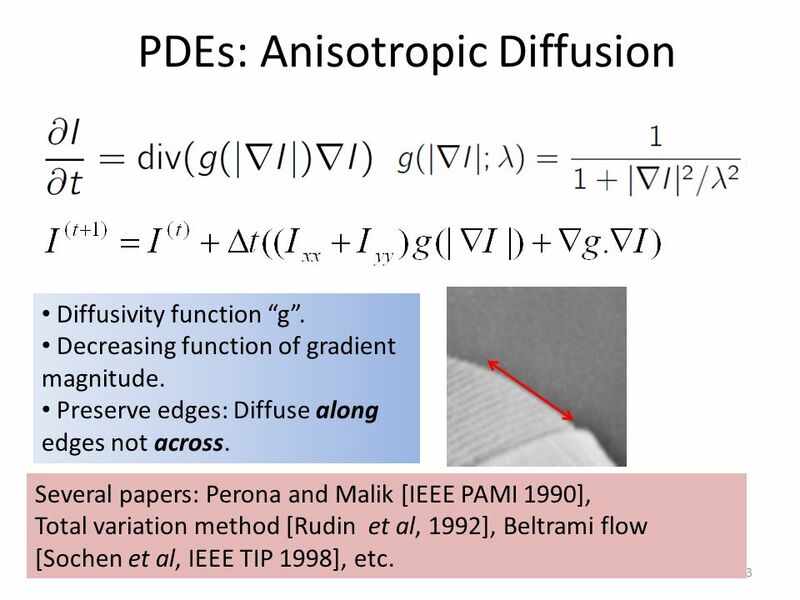 Several papers: Perona and Malik [IEEE PAMI 1990], Total variation method [Rudin et al, 1992], Beltrami flow [Sochen et al, IEEE TIP 1998], etc. 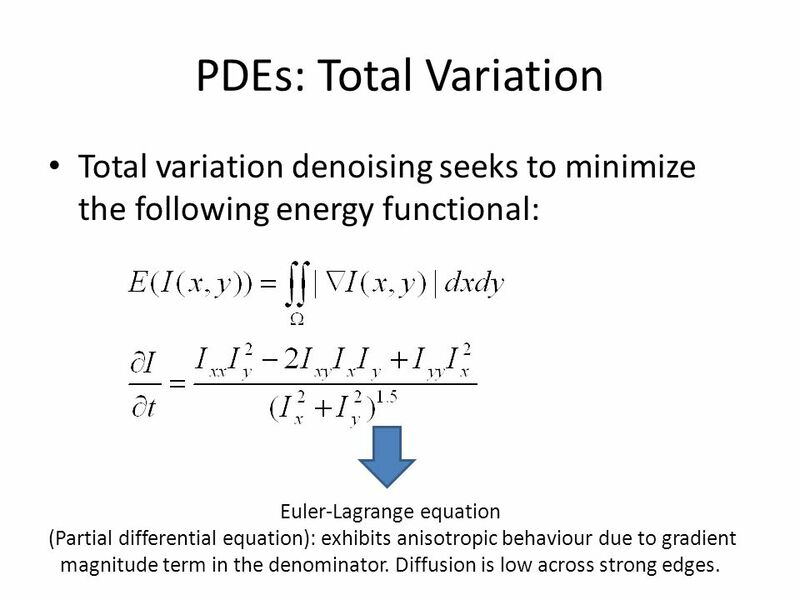 PDEs: Total Variation Total variation denoising seeks to minimize the following energy functional: Euler-Lagrange equation (Partial differential equation): exhibits anisotropic behaviour due to gradient magnitude term in the denominator. Diffusion is low across strong edges. 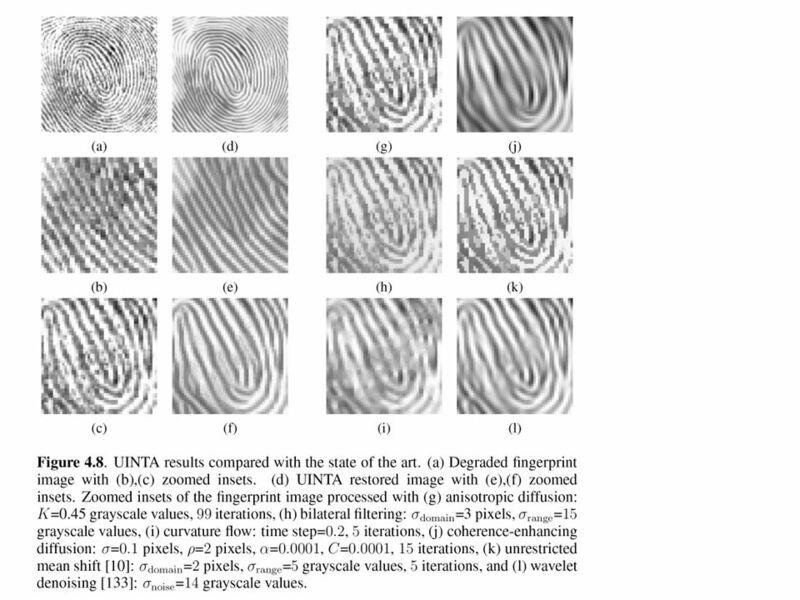 12 Comparative Results The anisotropic diffusion algorithm performs better than the others. 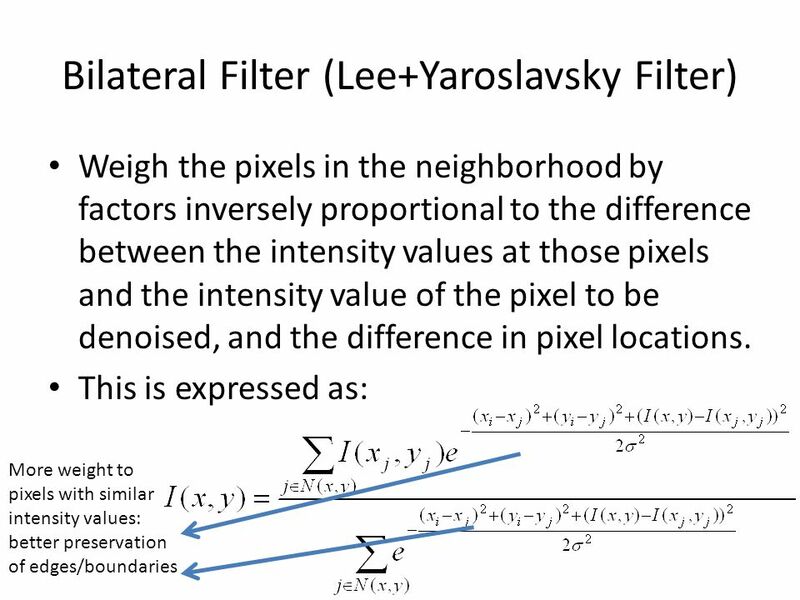 In the Yaroslavsky/Bilateral filter, the comparison between the intensity values is not very robust. This creates artifacts around the edges. 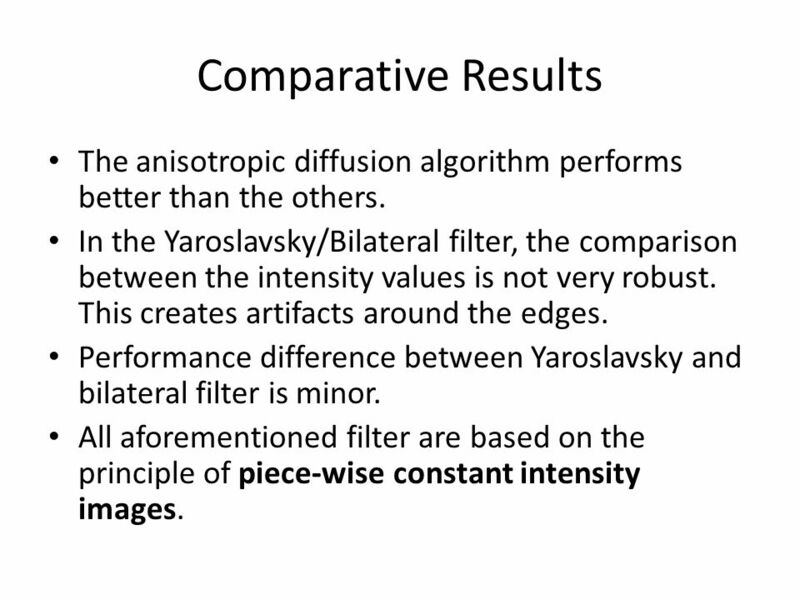 Performance difference between Yaroslavsky and bilateral filter is minor. 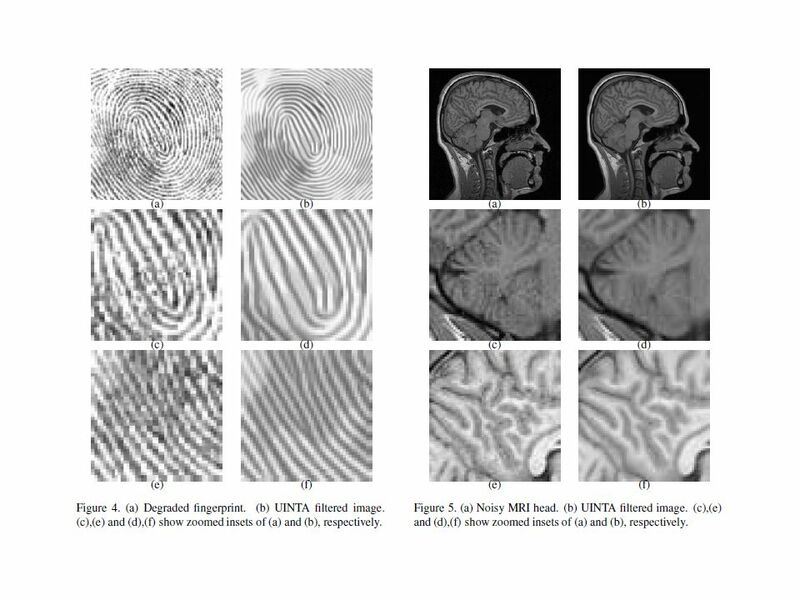 All aforementioned filter are based on the principle of piece-wise constant intensity images. 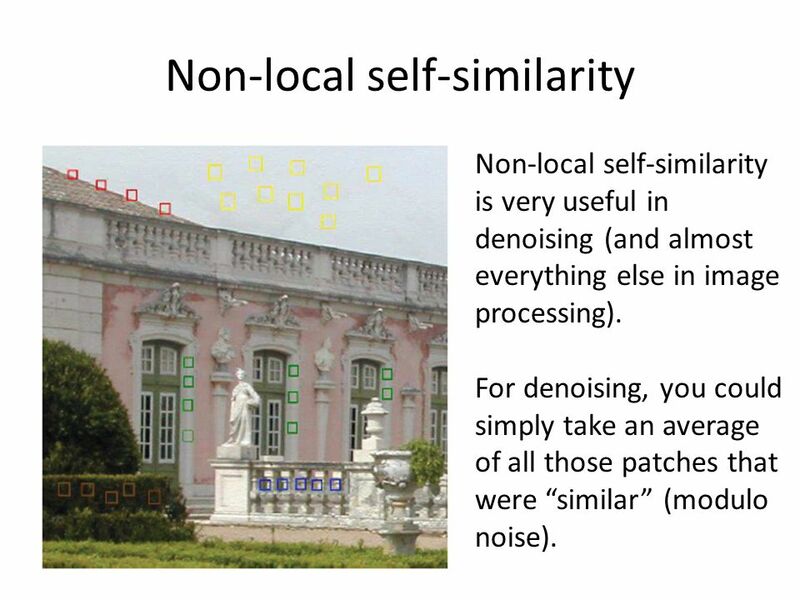 Non-local self-similarity is very useful in denoising (and almost everything else in image processing). 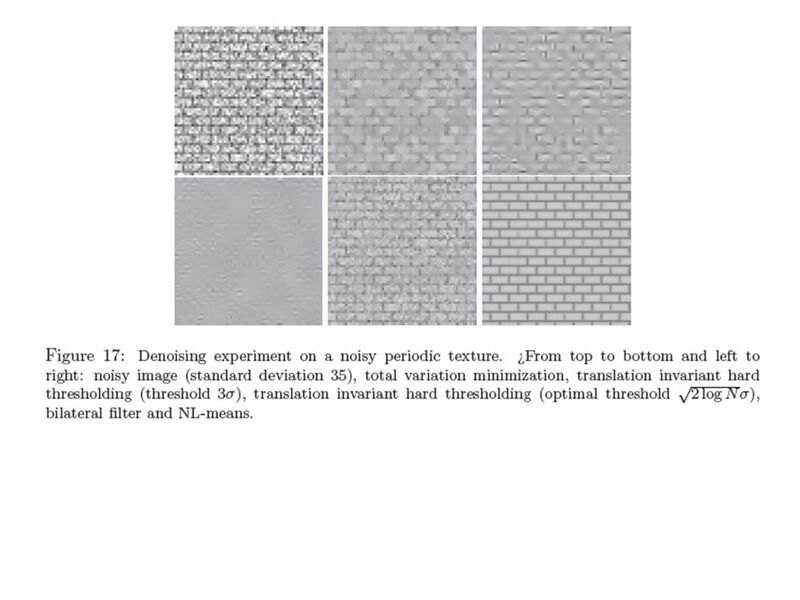 For denoising, you could simply take an average of all those patches that were “similar” (modulo noise). 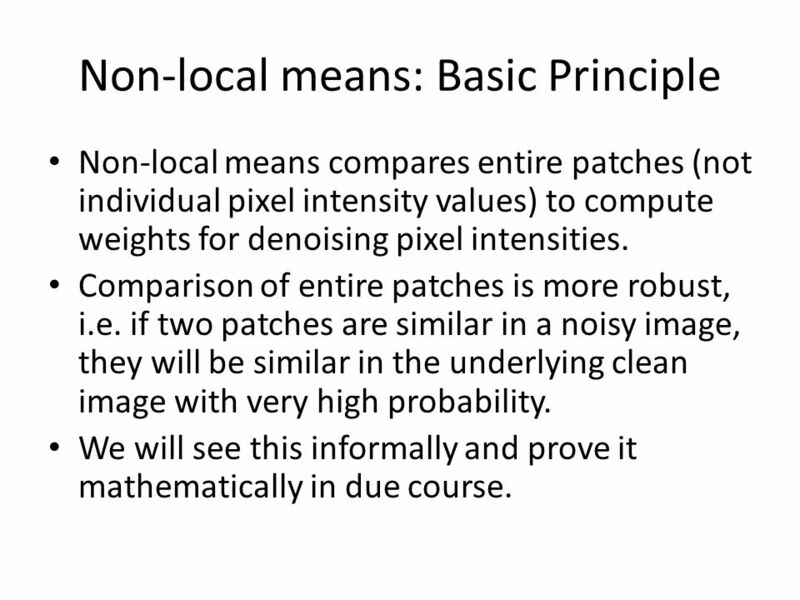 Non-local means compares entire patches (not individual pixel intensity values) to compute weights for denoising pixel intensities. Comparison of entire patches is more robust, i.e. 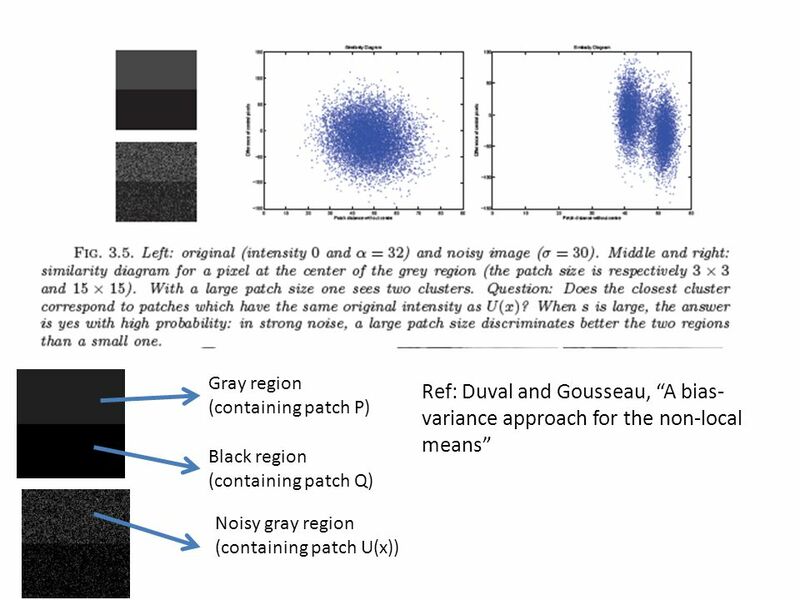 if two patches are similar in a noisy image, they will be similar in the underlying clean image with very high probability. We will see this informally and prove it mathematically in due course. 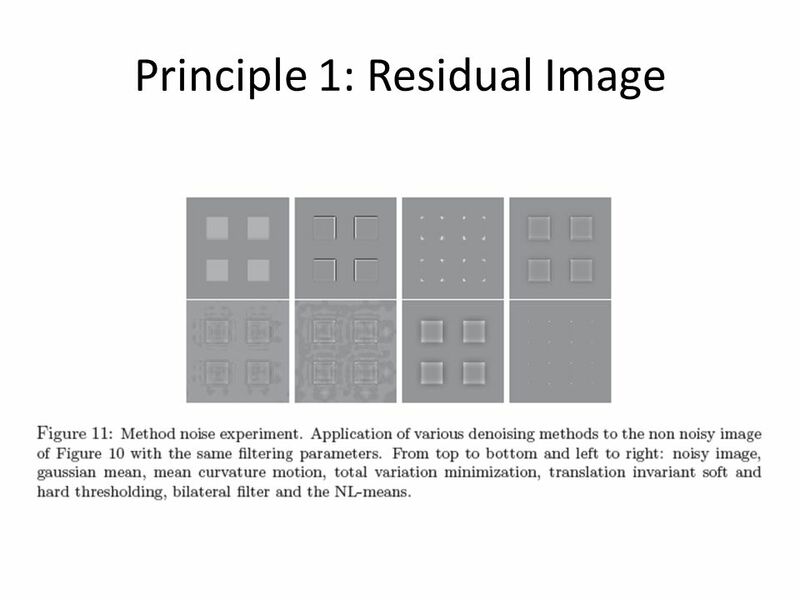 (1): The residual image (also called “method noise”) – defined as the difference between the noisy image and the denoised image – should look like (and have all the properties of) a pure noise image. 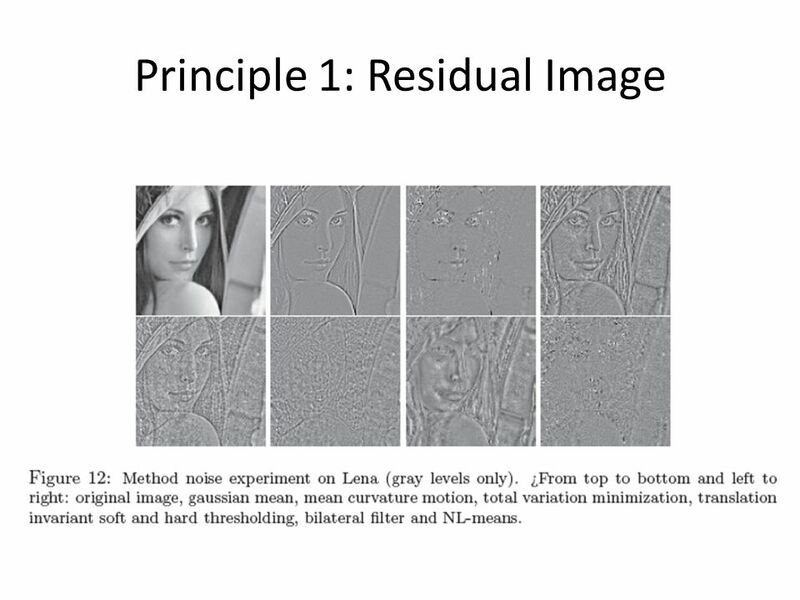 (2): A denoising algorithm should transform a pure noise image into another noise image (of lower variance). 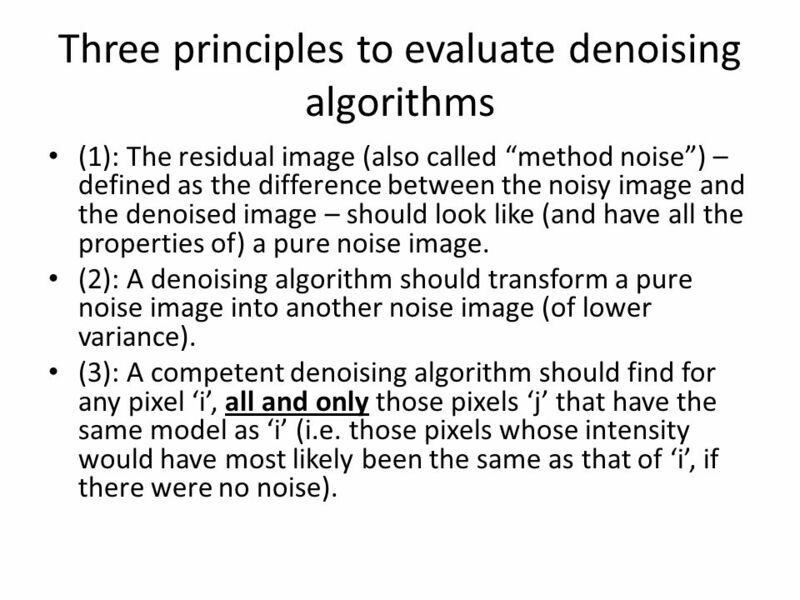 (3): A competent denoising algorithm should find for any pixel ‘i’, all and only those pixels ‘j’ that have the same model as ‘i’ (i.e. those pixels whose intensity would have most likely been the same as that of ‘i’, if there were no noise). 23 Principle 3: Correct models? 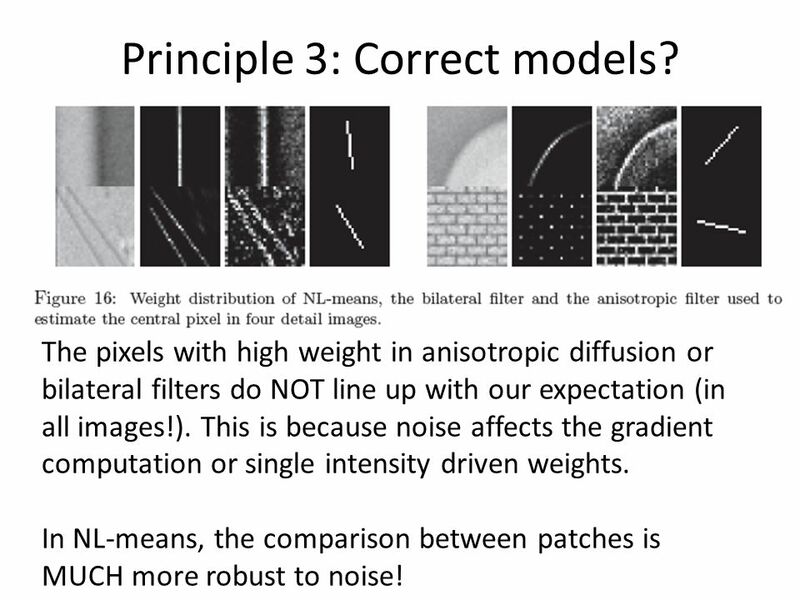 The pixels with high weight in anisotropic diffusion or bilateral filters do NOT line up with our expectation (in all images!). 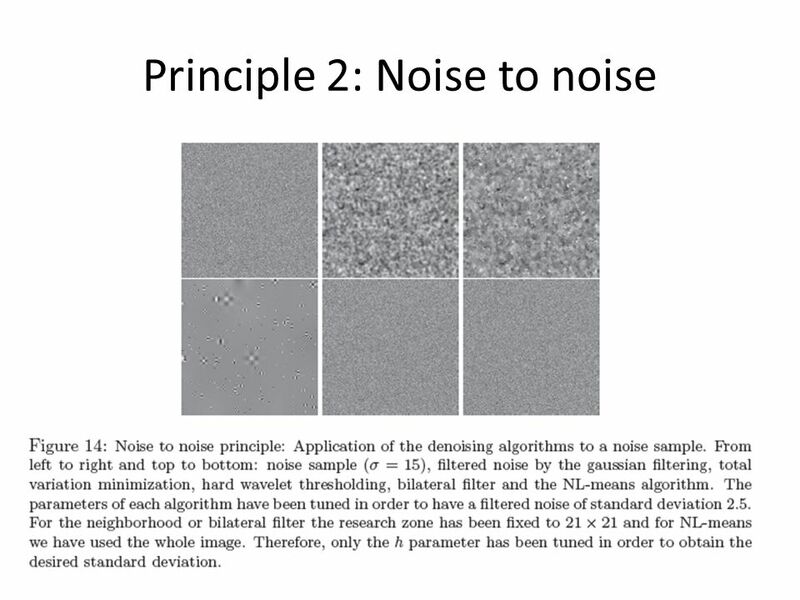 This is because noise affects the gradient computation or single intensity driven weights. 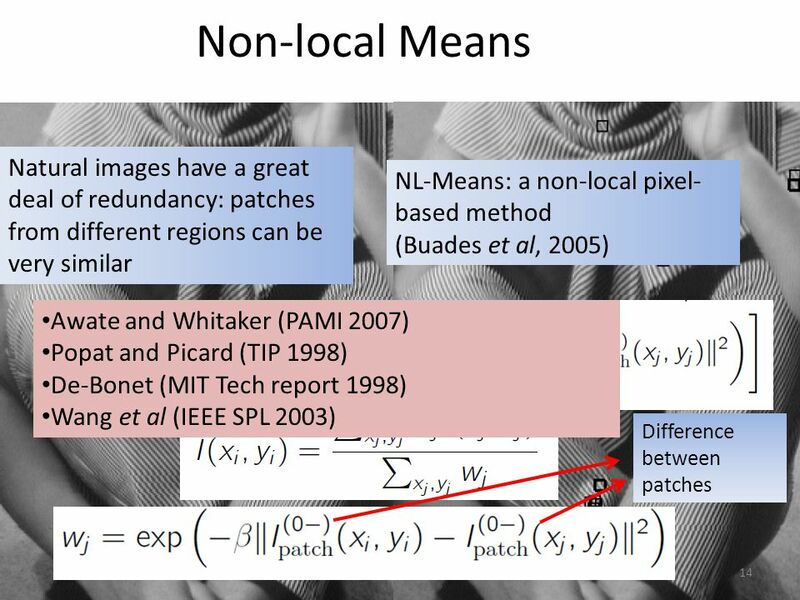 In NL-means, the comparison between patches is MUCH more robust to noise! 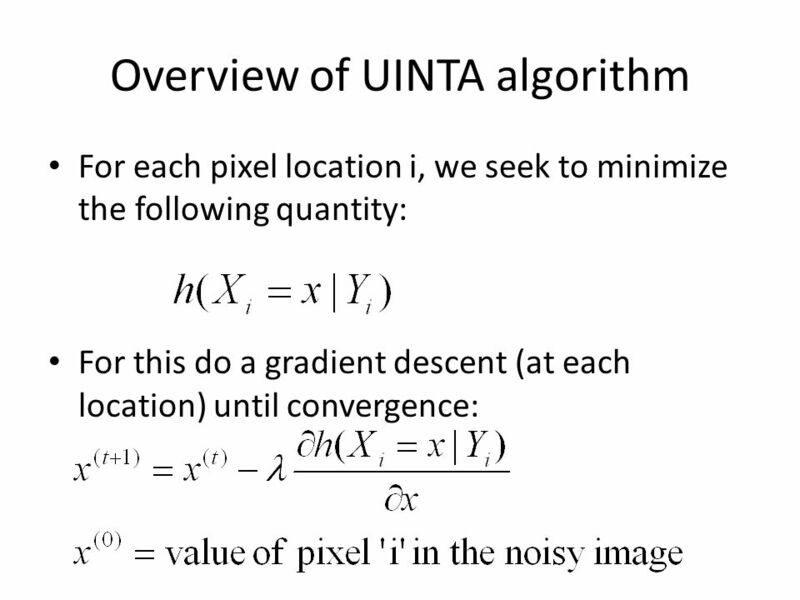 A drawback of the algorithm is its very high time complexity – O(N x N) for an image with N pixels. 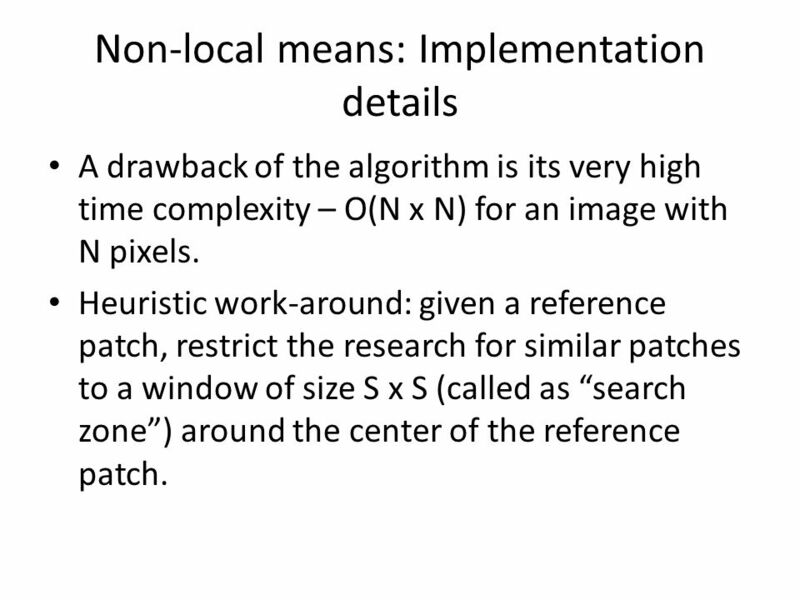 Heuristic work-around: given a reference patch, restrict the research for similar patches to a window of size S x S (called as “search zone”) around the center of the reference patch. 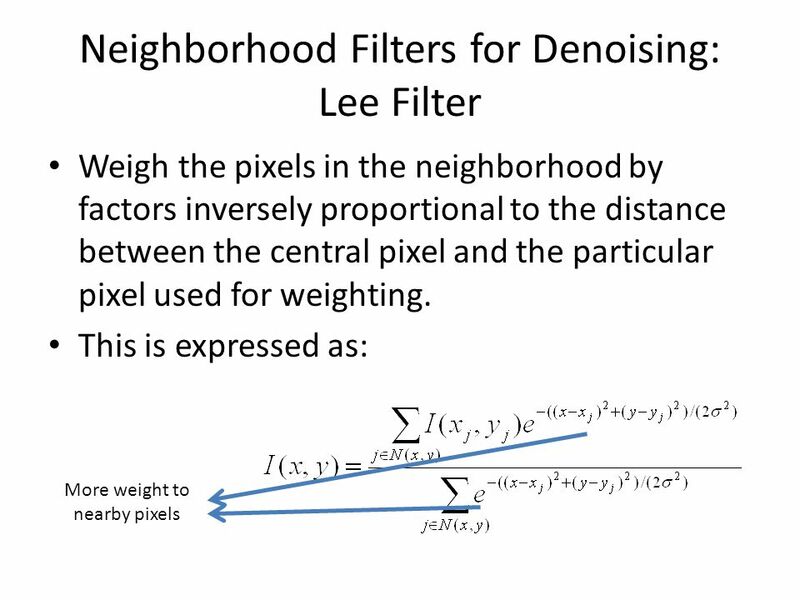 The parameter sigma to compute the weights will depend on the noise variance. 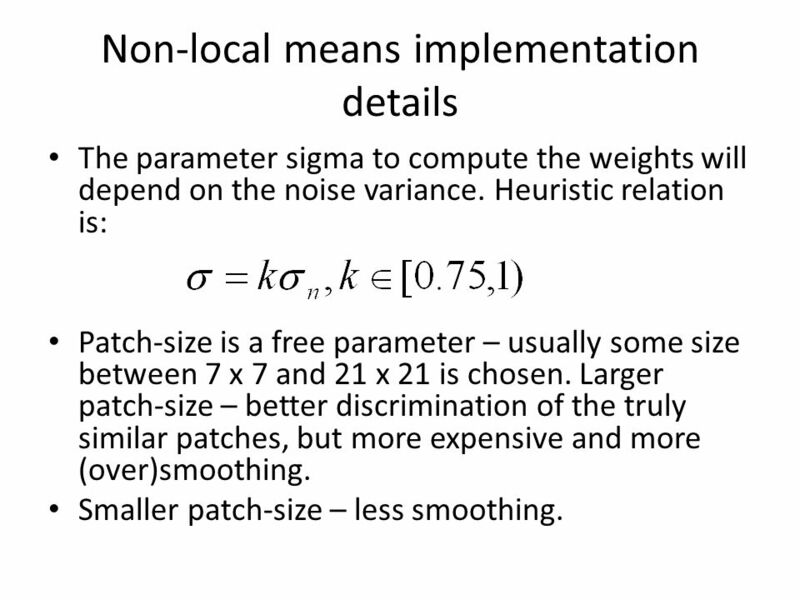 Heuristic relation is: Patch-size is a free parameter – usually some size between 7 x 7 and 21 x 21 is chosen. 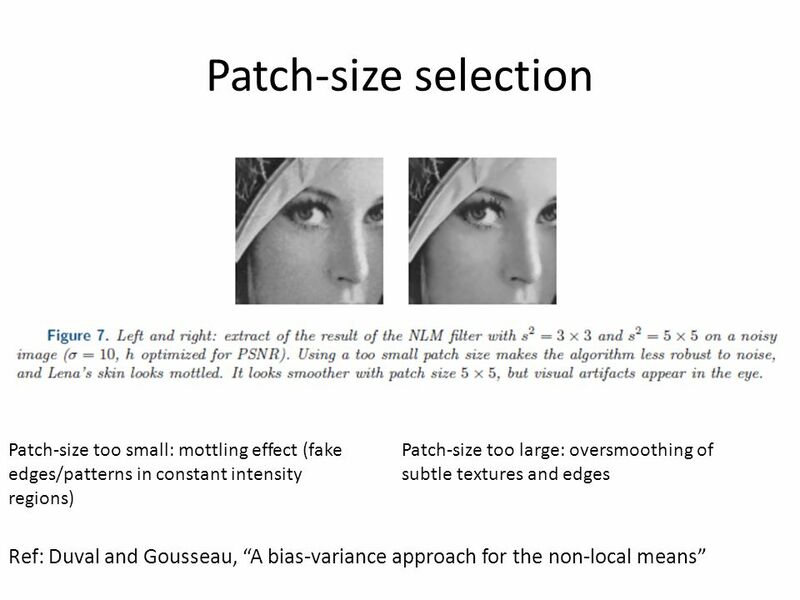 Larger patch-size – better discrimination of the truly similar patches, but more expensive and more (over)smoothing. Smaller patch-size – less smoothing. 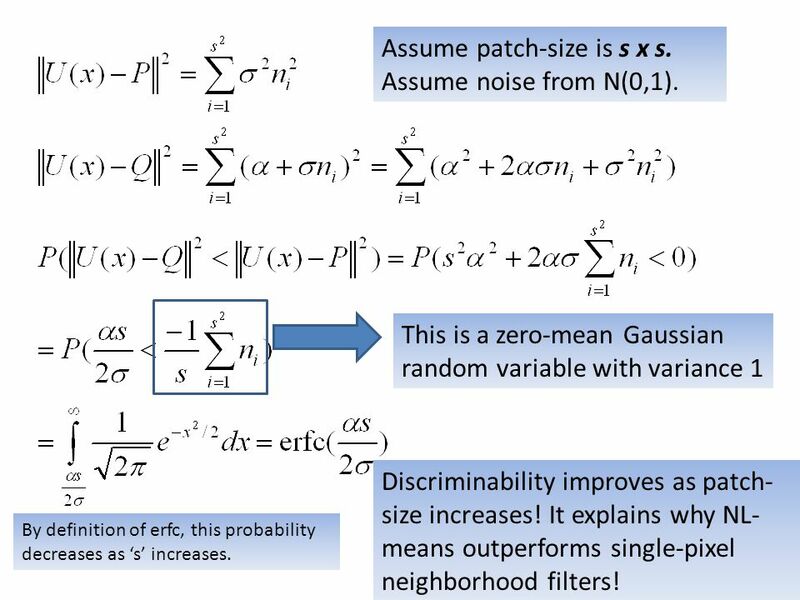 28 Assume patch-size is s x s. Assume noise from N(0,1). 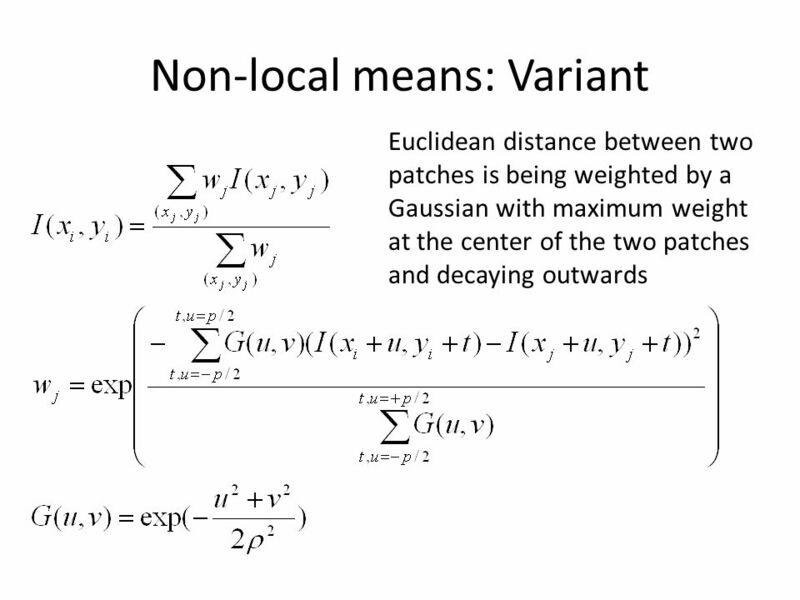 This is a zero-mean Gaussian random variable with variance 1 Discriminability improves as patch-size increases! 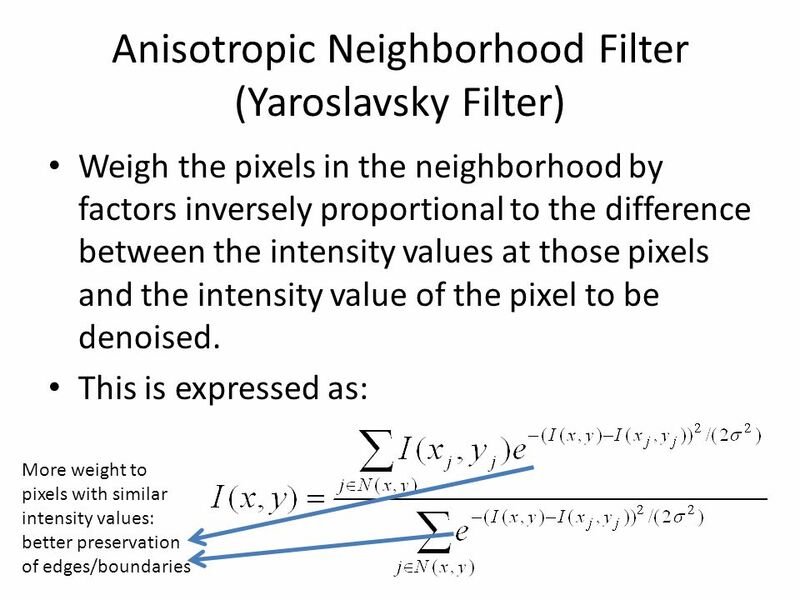 It explains why NL-means outperforms single-pixel neighborhood filters! 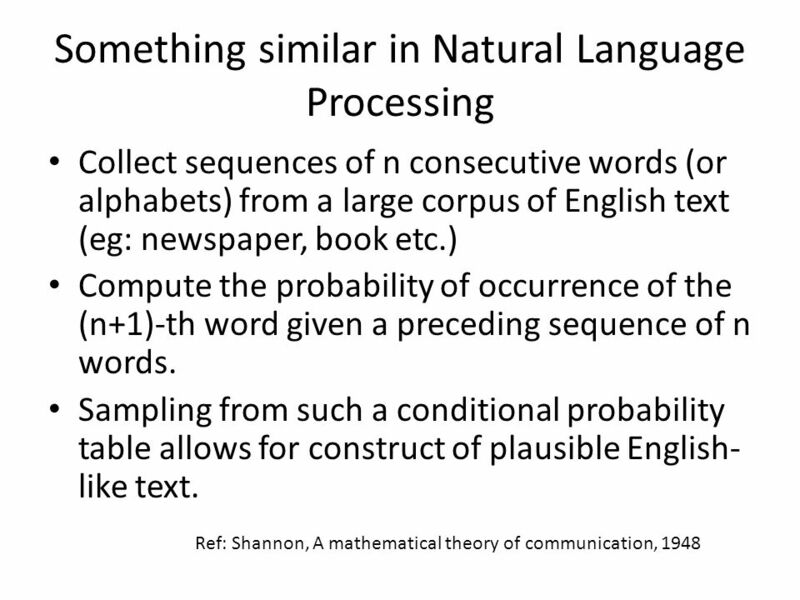 By definition of erfc, this probability decreases as ‘s’ increases. 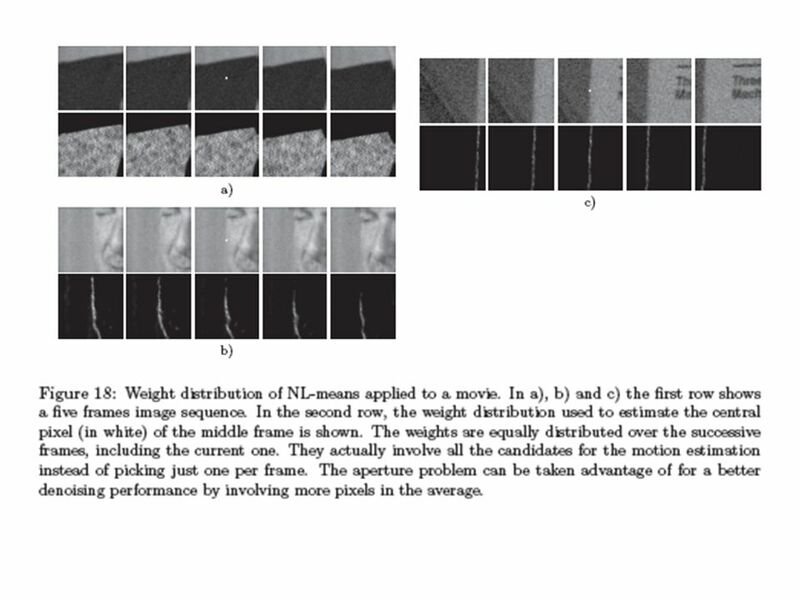 For video-denoising, simply denoising each individual frame independently ignores temporal similarity or redundancy. 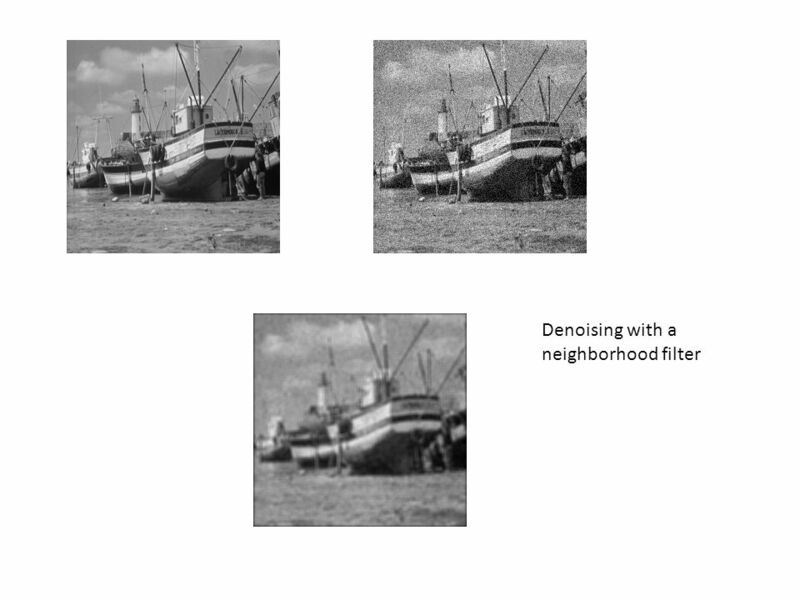 Most video denoising algorithms first perform a motion compensation step: (1) estimate the motion between consecutive frames, and (2) align each successive frame to its previous frame. 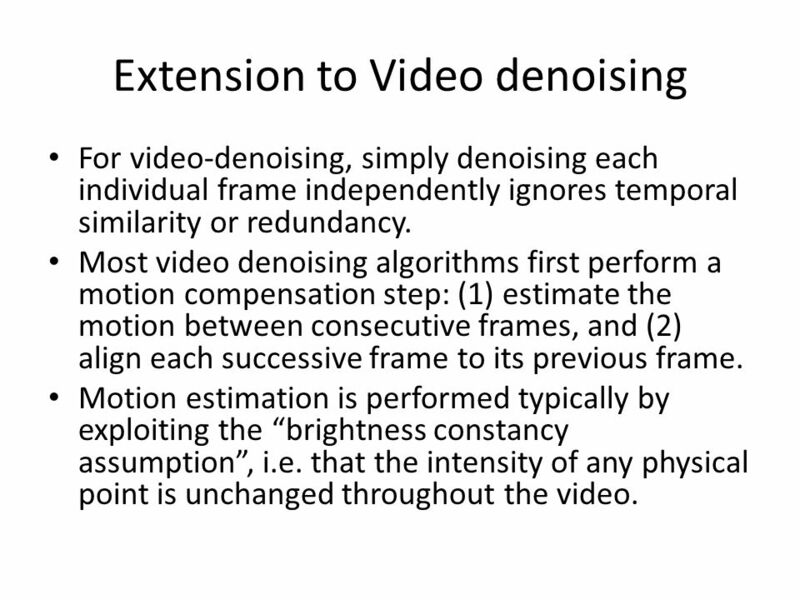 Motion estimation is performed typically by exploiting the “brightness constancy assumption”, i.e. that the intensity of any physical point is unchanged throughout the video. 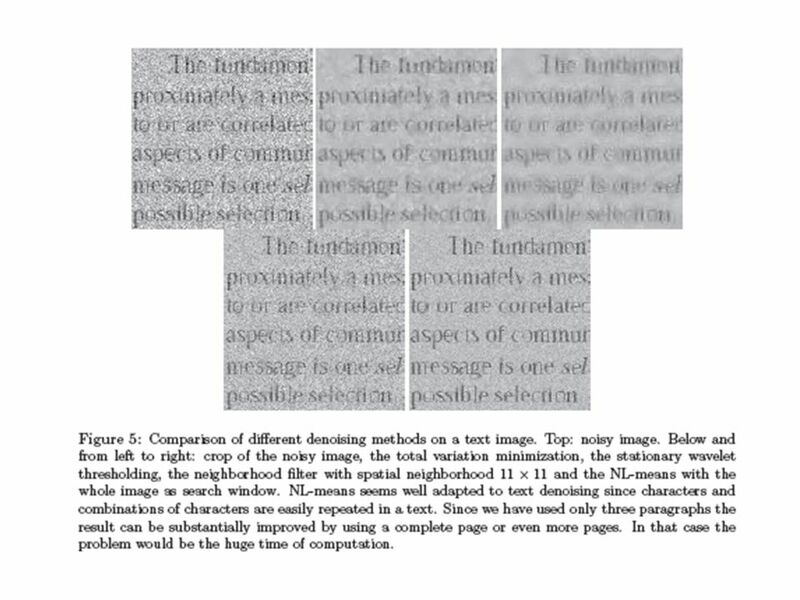 The most popular motion compensation algorithms also assume that the motion of nearby pixels is similar (motion smoothness assumption). 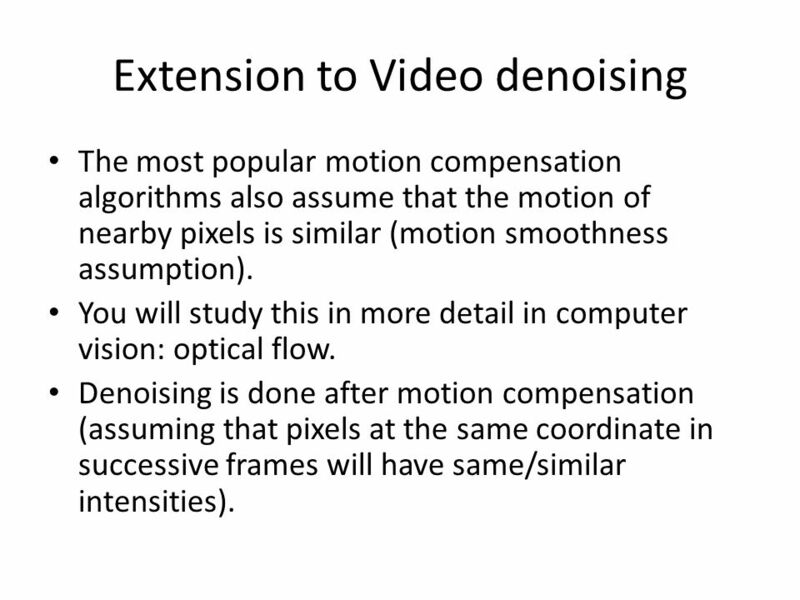 You will study this in more detail in computer vision: optical flow. Denoising is done after motion compensation (assuming that pixels at the same coordinate in successive frames will have same/similar intensities). 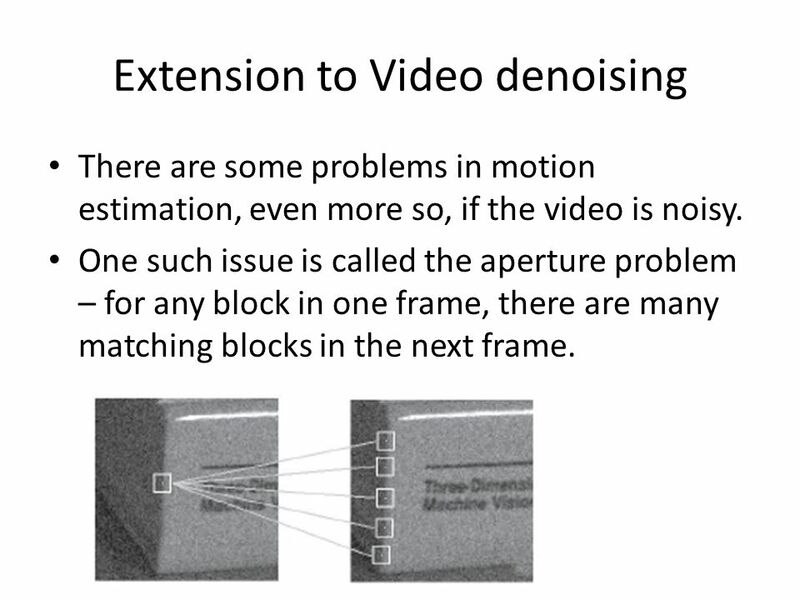 There are some problems in motion estimation, even more so, if the video is noisy. 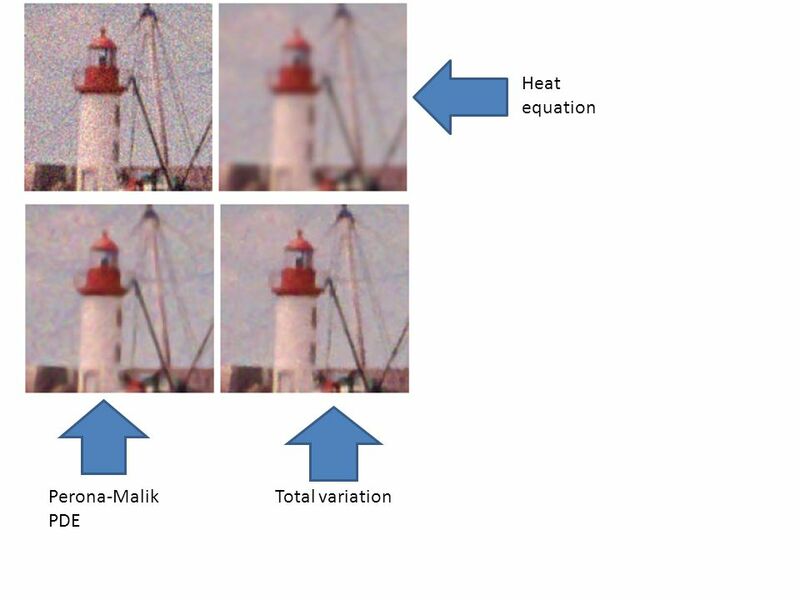 One such issue is called the aperture problem – for any block in one frame, there are many matching blocks in the next frame. 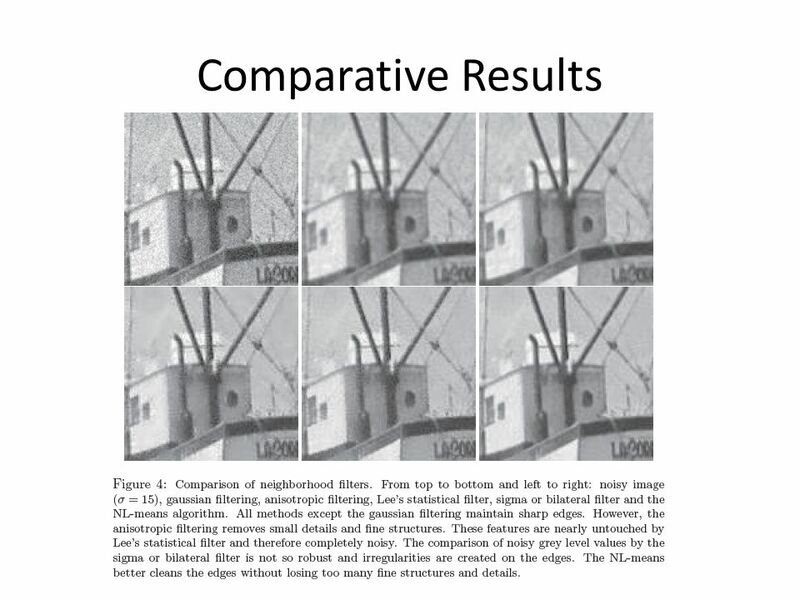 The motion smoothness assumption is one way to alleviate the aperture problem (again, you will study this in more detail in computer vision). 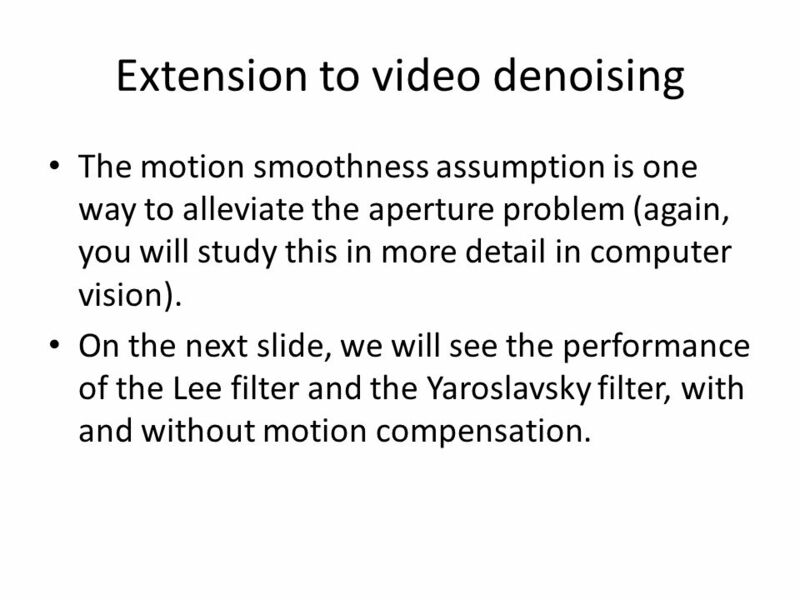 On the next slide, we will see the performance of the Lee filter and the Yaroslavsky filter, with and without motion compensation. 34 NL-means performs much better! 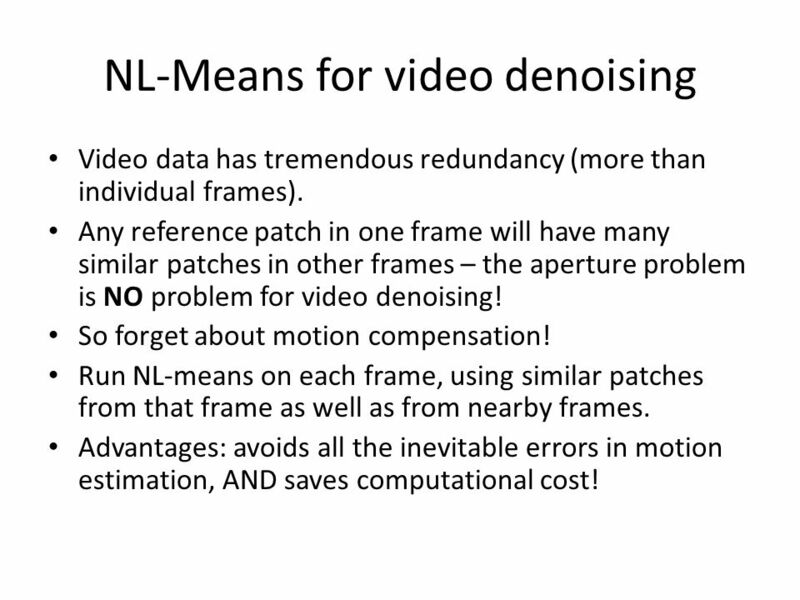 Video data has tremendous redundancy (more than individual frames). Any reference patch in one frame will have many similar patches in other frames – the aperture problem is NO problem for video denoising! So forget about motion compensation! Run NL-means on each frame, using similar patches from that frame as well as from nearby frames. Advantages: avoids all the inevitable errors in motion estimation, AND saves computational cost! 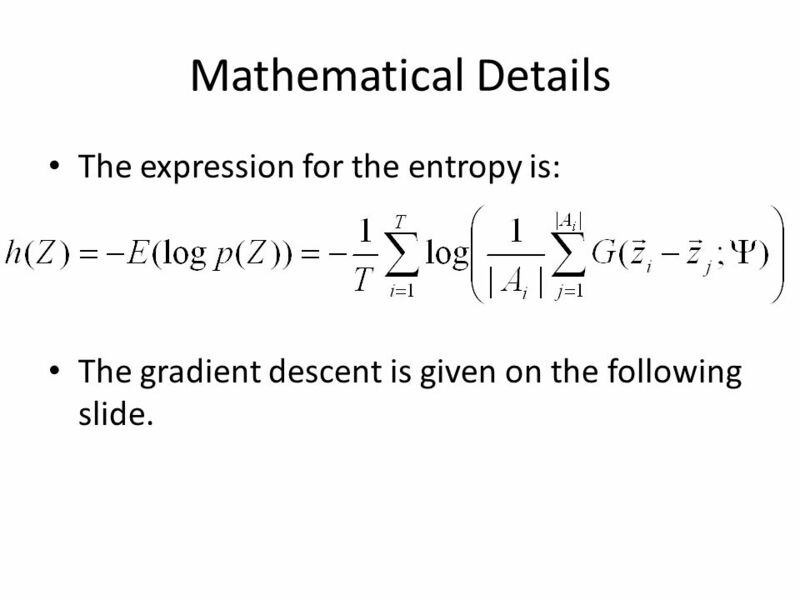 The gradient descent is given on the following slide. 43 Note! Note! 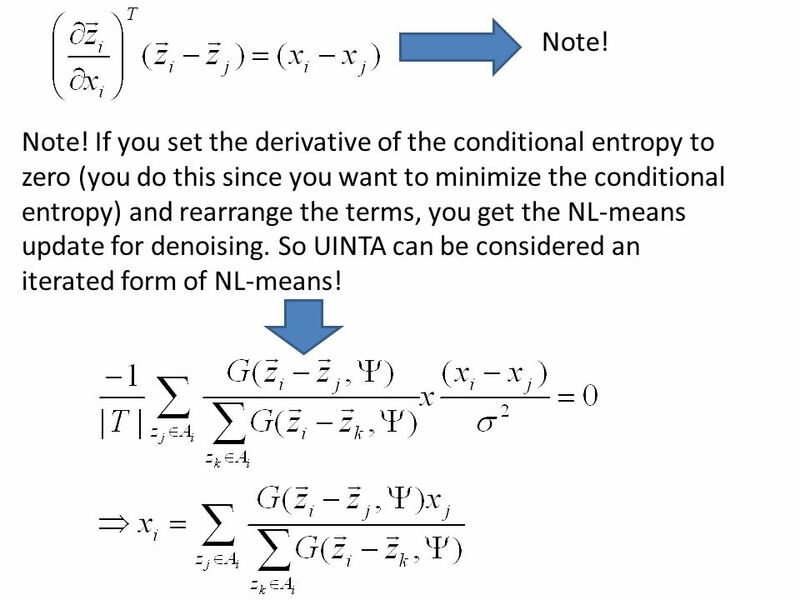 If you set the derivative of the conditional entropy to zero (you do this since you want to minimize the conditional entropy) and rearrange the terms, you get the NL-means update for denoising. 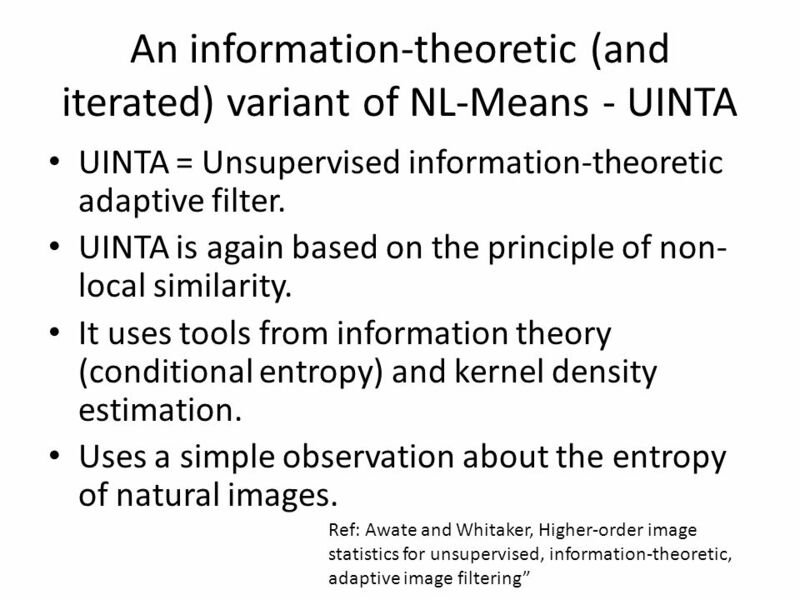 So UINTA can be considered an iterated form of NL-means! 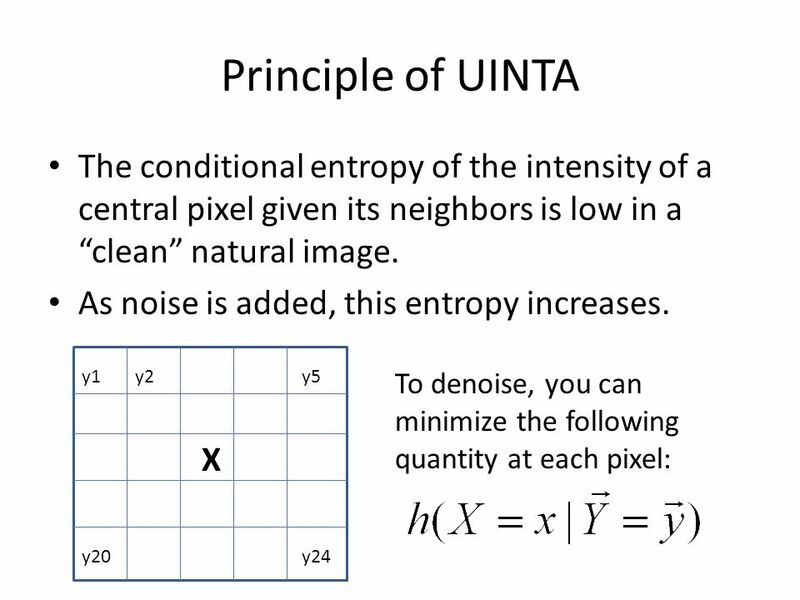 A technique similar (in principle) to UINTA was developed by Popat and Picard in 1997. 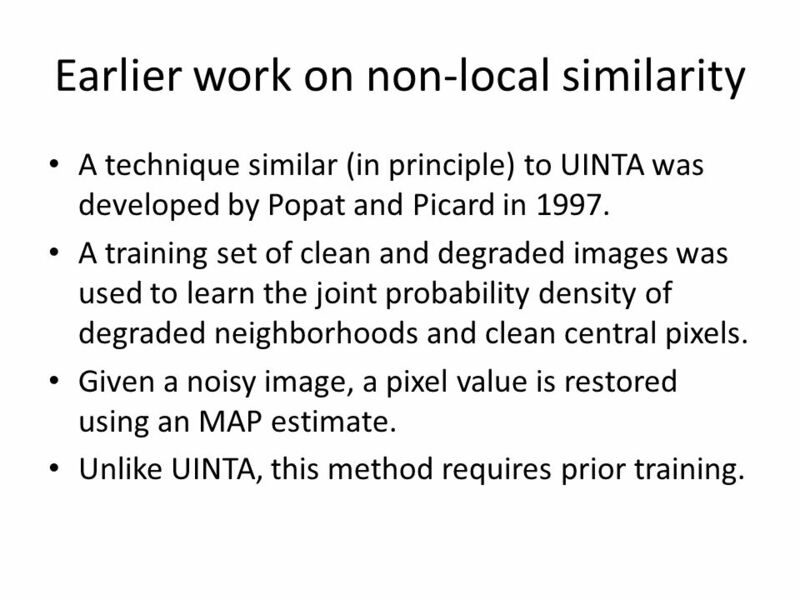 A training set of clean and degraded images was used to learn the joint probability density of degraded neighborhoods and clean central pixels. 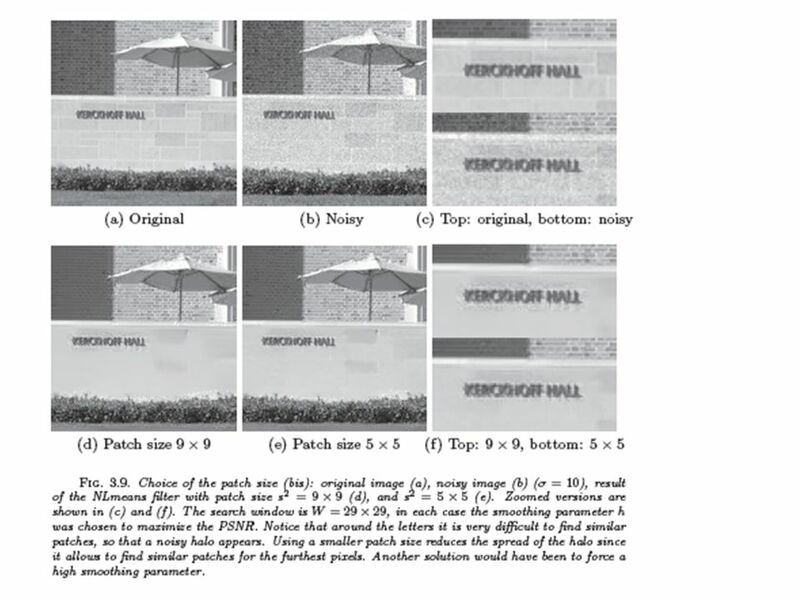 Given a noisy image, a pixel value is restored using an MAP estimate. Unlike UINTA, this method requires prior training. 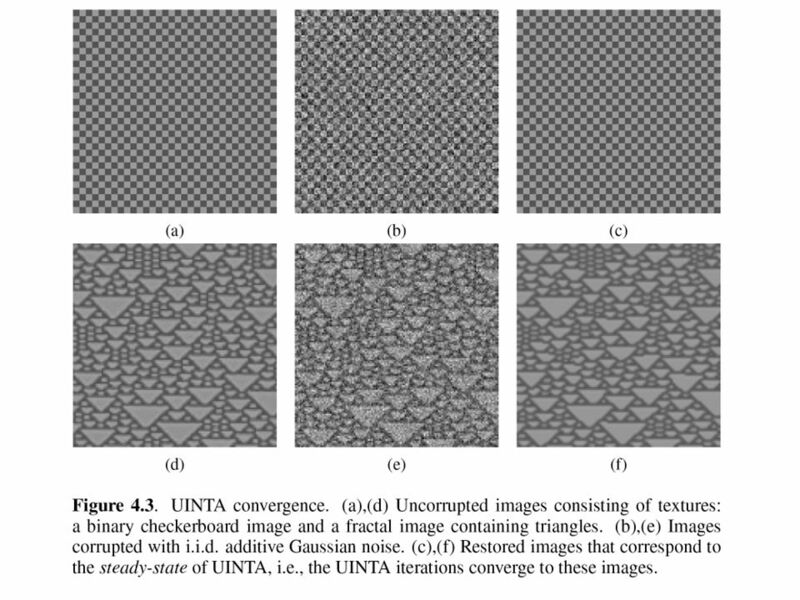 Ref: Efros and Leung, “Texture Synthesis by Non-parametric sampling” Remember: a texture image contains very high repetition of “similar” patches all over! 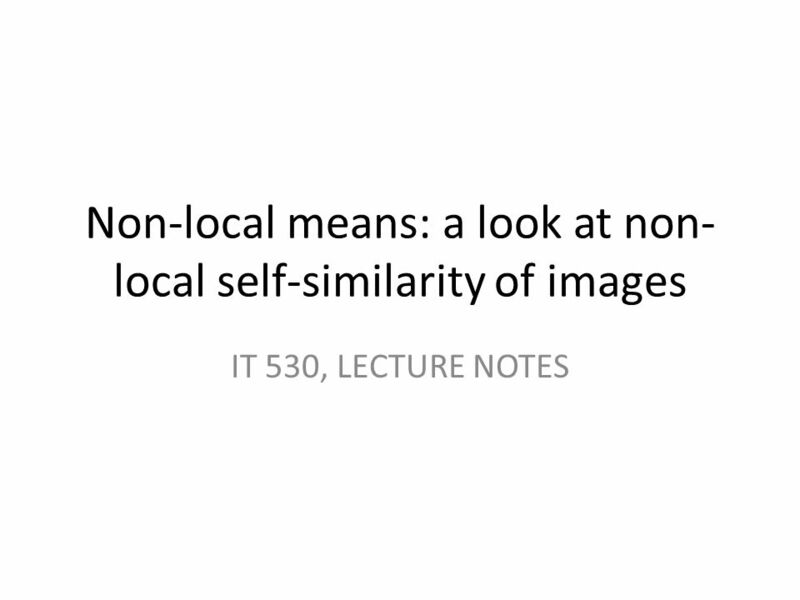 Download ppt "Non-local means: a look at non-local self-similarity of images"
Transform-based Non-local Methods for Image Restoration IT530, Lecture Notes. 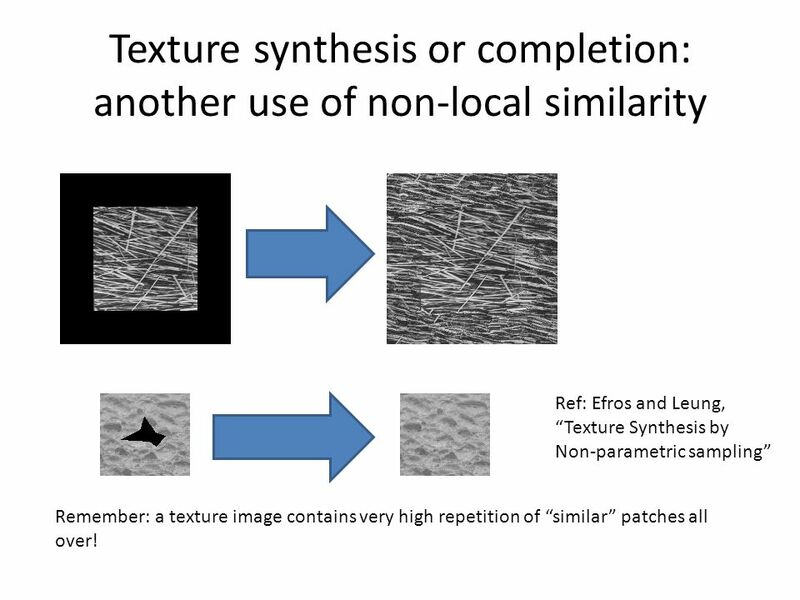 Data-driven methods: Texture (Sz 10.5) Cs129 Computational Photography James Hays, Brown, Spring 2011 Many slides from Alexei Efros. R. DOSIL, X. M. PARDO, A. MOSQUERA, D. CABELLO Grupo de Visión Artificial Departamento de Electrónica e Computación Universidade de Santiago de Compostela. Texture. Edge detectors find differences in overall intensity. Average intensity is only simplest difference. 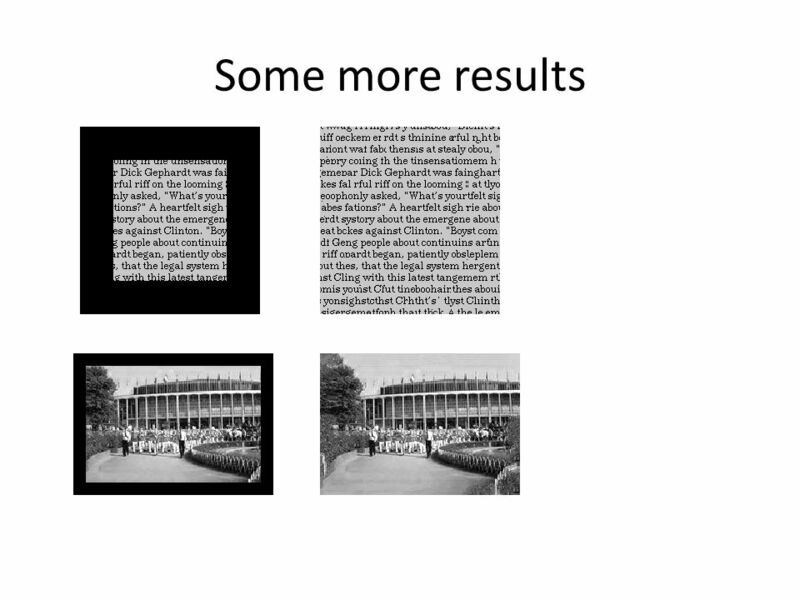 many slides from David Jacobs. 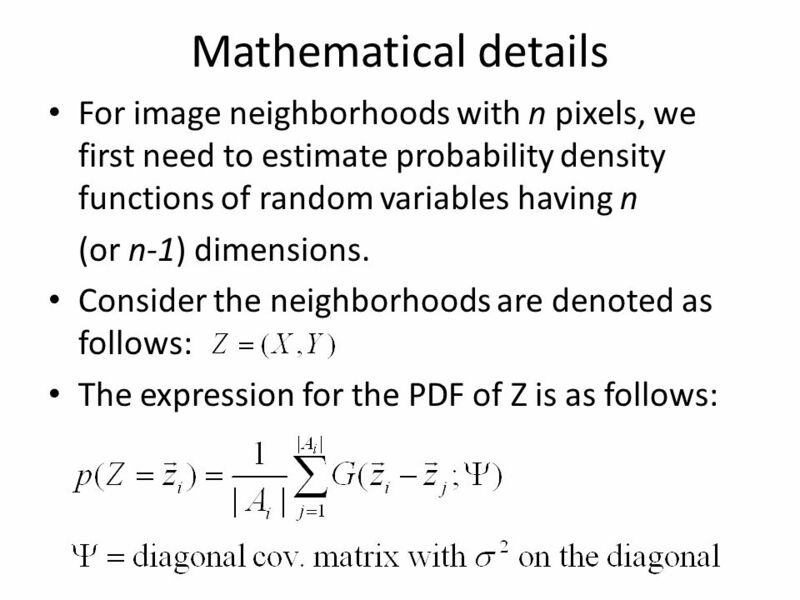 Low Complexity Keypoint Recognition and Pose Estimation Vincent Lepetit. Chapter 8-3 Markov Random Fields 1. Topics 1. Introduction 1. 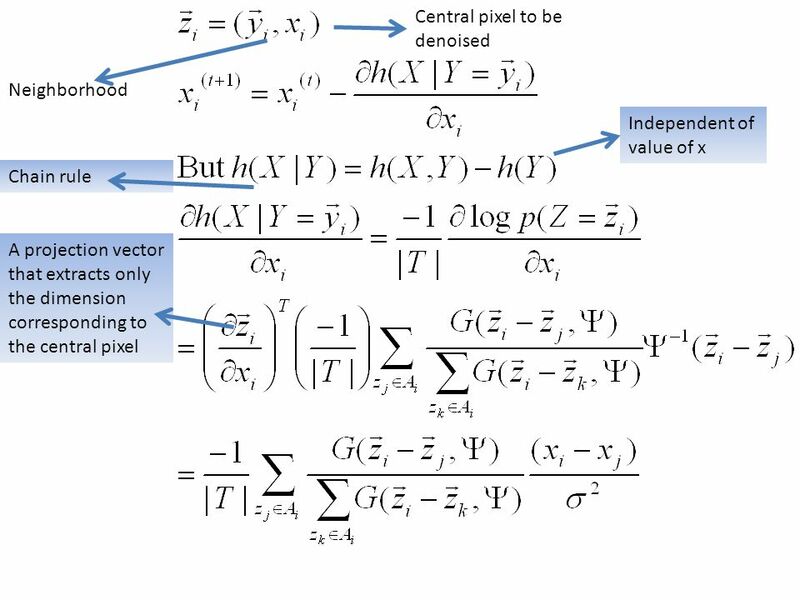 Undirected Graphical Models 2. 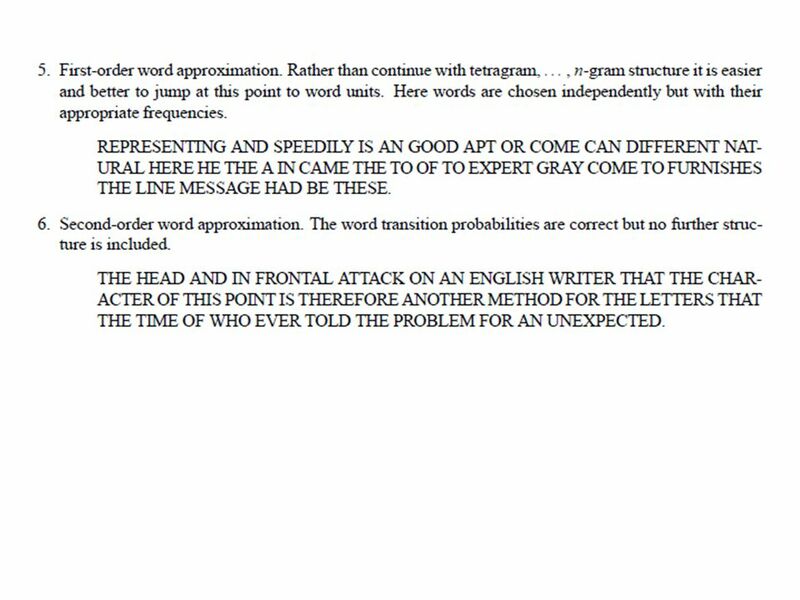 Terminology 2. Conditional Independence 3. Factorization. 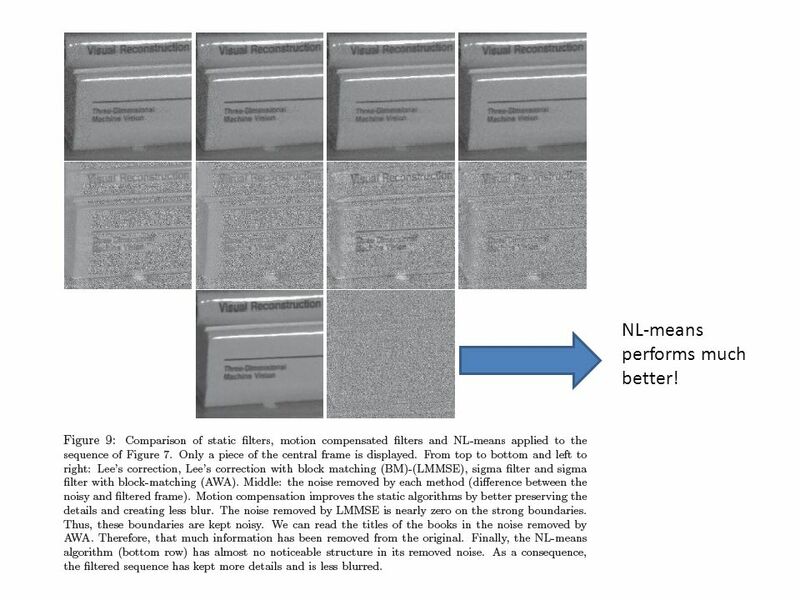 A LOW-COMPLEXITY, MOTION-ROBUST, SPATIO-TEMPORALLY ADAPTIVE VIDEO DE-NOISER WITH IN-LOOP NOISE ESTIMATION Chirag Jain, Sriram Sethuraman Ittiam Systems. A New Block Based Motion Estimation with True Region Motion Field Jozef Huska & Peter Kulla EUROCON 2007 The International Conference on “Computer as a.
Ljubomir Jovanov Aleksandra Piˇzurica Stefan Schulte Peter Schelkens Adrian Munteanu Etienne Kerre Wilfried Philips Combined Wavelet-Domain and Motion-Compensated. 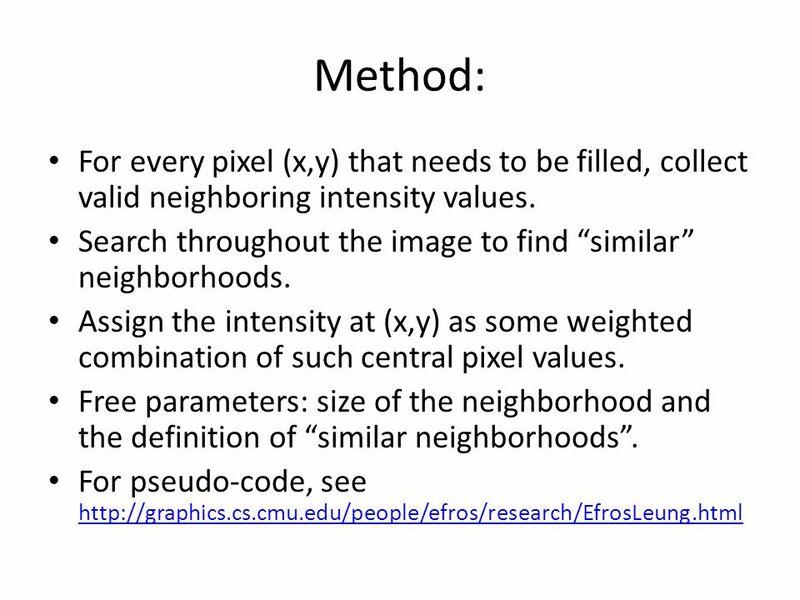 Image processing. 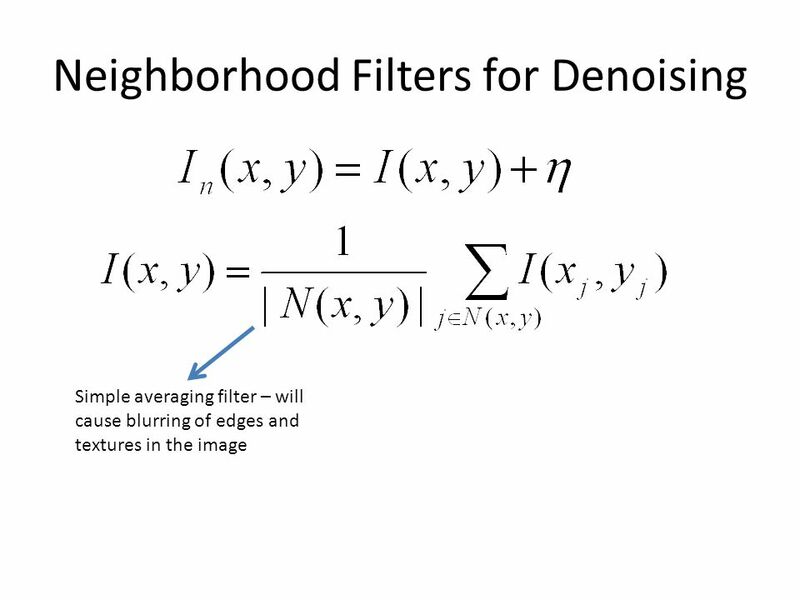 Image operations Operations on an image –Linear filtering –Non-linear filtering –Transformations –Noise removal –Segmentation.